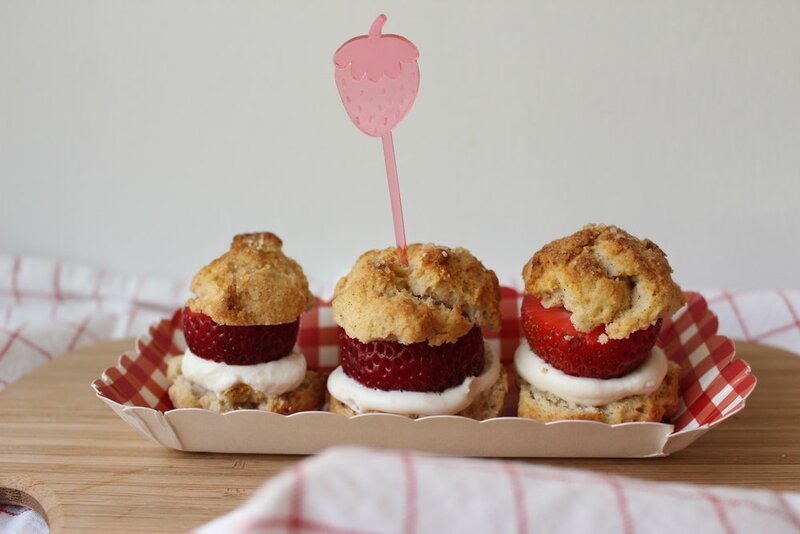 The road to these stupidly easy strawberry shortcakes was long and winding. I started obsessing about scones right around the royal wedding and thought, these would make a great base for a shortcake. Upon further research, I learned that "short" cake just means a cake with a high fat-to-flour ratio, like scones or biscuits. But I wondered, what's the difference between the two? Martha Stewart thinks they're basically the same, but many commenters found that suggestion insulting to both Brits and southerners. Food52 had a much more detailed description of the differences, but after reading I felt less inclined to use either traditional scones (too much butter) or traditional biscuits (too much technique) as my shortcake base. The only specific shortcake recipe I found that appealed to me was the classic from Bon Appetite, but it calls for two hard-boiled egg yolks and I'm generally too lazy for that. See the tiny flecks of black? Those are the vanilla beans dispersed in the cream. Enter, the Never-fail Biscuit from King Arthur. These use no butter, so if you're looking for a butter-y flavor, these may not be your biscuits. However, they are so so easy and come together so fast. 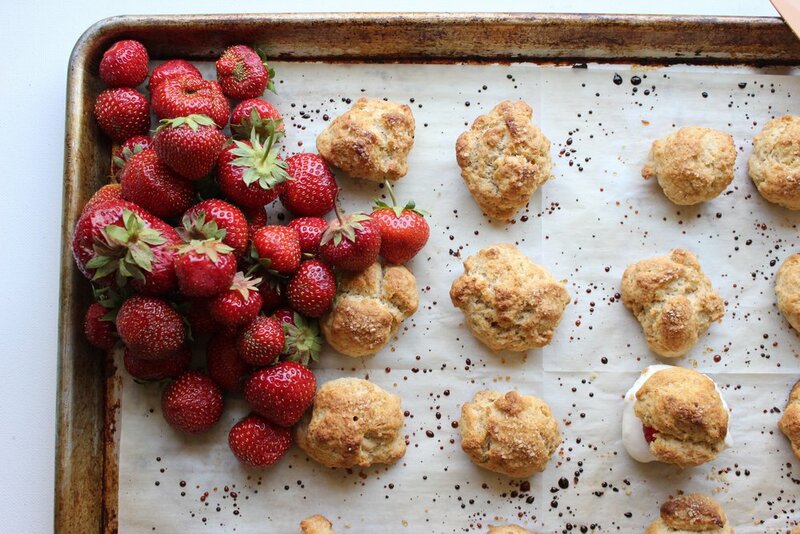 There's no resting or freezing or rolling or cutting, but you end up with a flaky, risen biscuit that is easily adapted into a sweet shortcake. And! 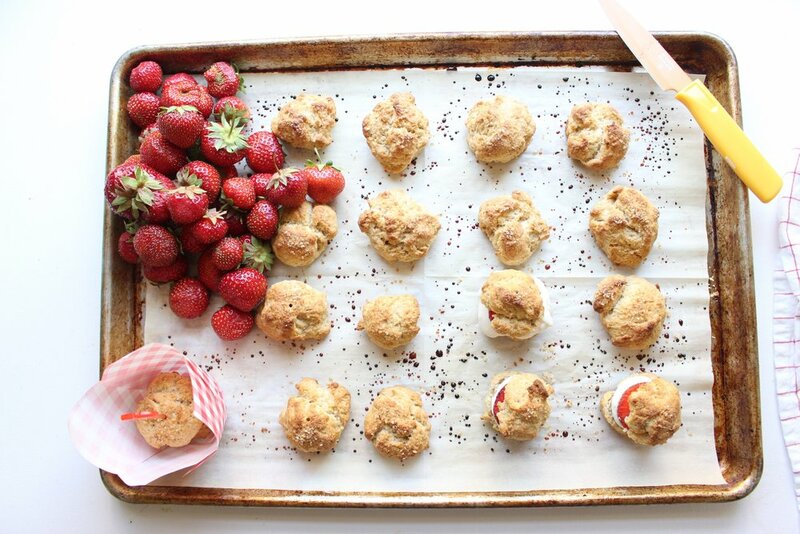 These are tiny, two-bite shortcakes, so you get the taste of sweet summer fruit, without eating a huge dessert. I didn't healthify these thanks to the tiny portion size, but you could surely swap in gluten-free flour, full-fat coconut milk, and coconut sugar in this recipe with good results. - I made lots of changes because I wanted sweet biscuits and I didn't have self-rising flour, so I had to fiddle with the ratios of salt, flour, and baking powder a bit. In the end, I used less salt and less baking powder than the original recipe. - I also added more sugar, a little more cream, and half of a vanilla bean instead of using an extract (though you could add 2 teaspoons of vanilla extract instead. KA suggests using 1 tablespoon, but I felt like I could taste the alcohol of the extract a bit). - You want to really make sure these shortcakes are cooked. I don't know why, but I felt like I could taste raw flour before I cooked them for an extra minute or two. See notes in the recipe for some tricks to tell if they're really done. Preheat the oven to 450. Combine the dry ingredients in a large bowl and whisk to combine. Measure the heavy cream in a large measuring cup and add one extra tablespoon. Using a small sharp knife, cut the vanilla bean pod in half lengthwise. Scrape out the inside of the pod and add the brown seeds to the liquid. Whisk vigorously to disperse the vanilla beans. 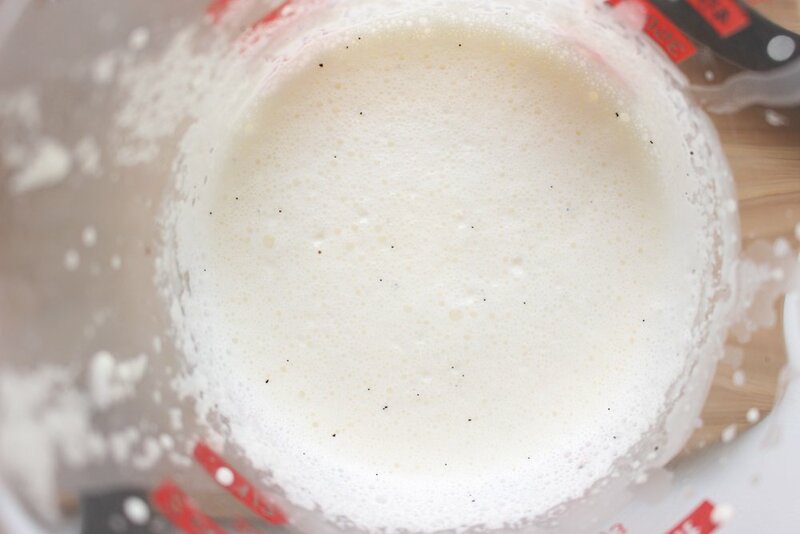 Pour the wet ingredients into the dry, making sure to scoop out any vanilla beans on the bottom of the cream mixture. 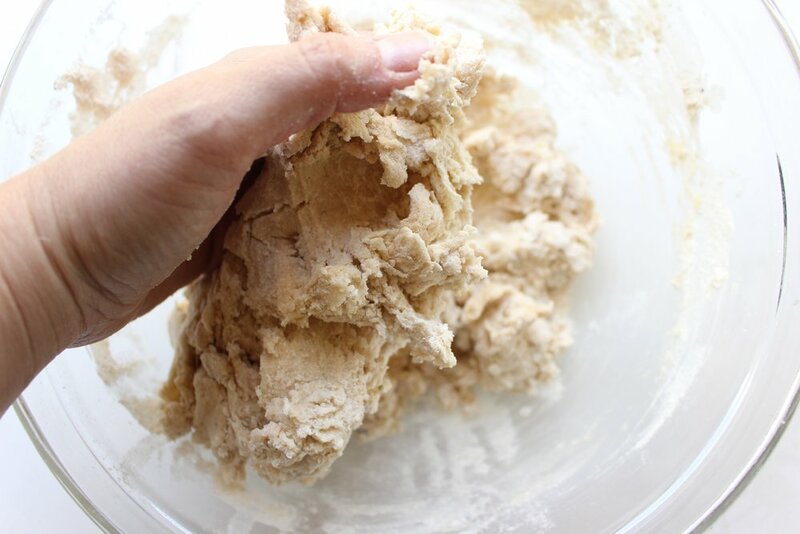 Mix just until the wet and dry ingredients come together and begin to look like a flaky dough. This is a dry-ish dough, but you should be able to form the mixture into a ball easily with your hands. If the dough is falling apart, add ½ of tablespoon of cream at a time and mix again with your hands. You want the dough just coming together without falling apart, but without becoming too wet. 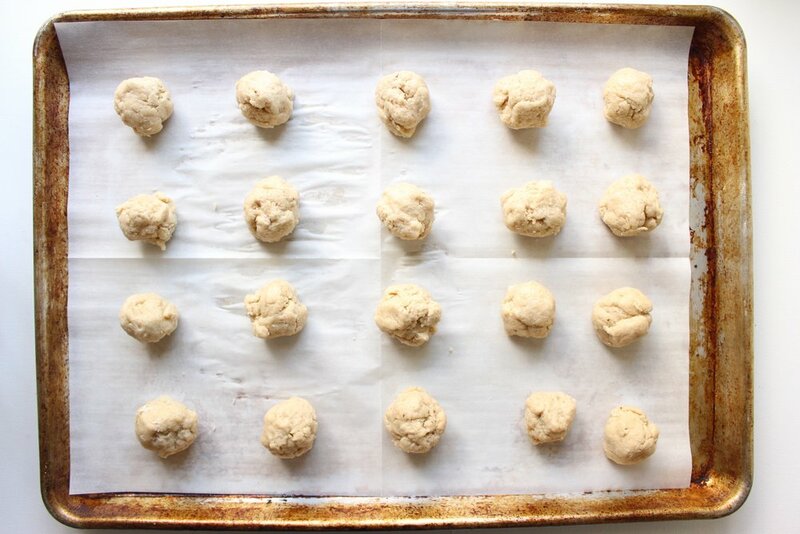 When the dough is together, scoop off a small amount (about 1 tablespoon) and lightly roll into a ball with your hands. 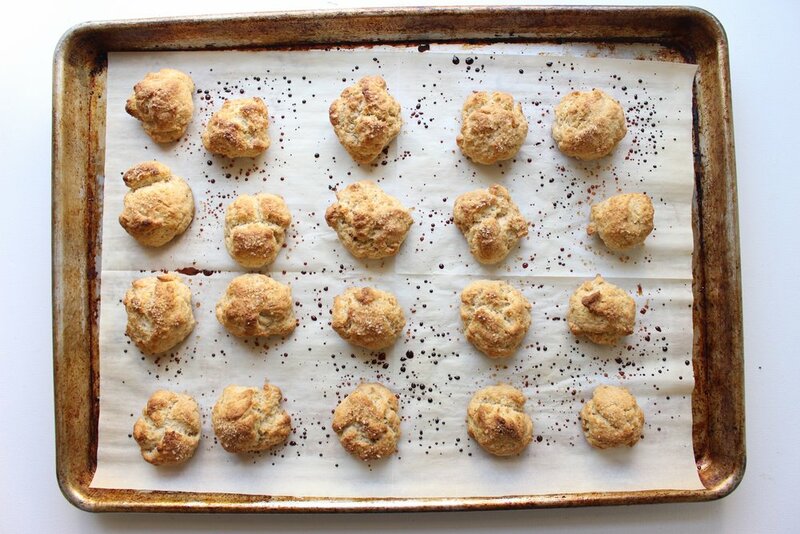 Place the balls on a parchment-lined baking sheet. Sprinkle the tops of each ball with demarara or other coarse sugar. Bake for 10-12 minutes, rotating the tray once during baking. My best indication that the shortcakes are done was that the extra sugar on the tray (not on the shortcakes) had burned ever-so-slightly and the bottoms of the shortcakes were a dark caramel brown.